As college women, we are constantly busy. Whether it be class, meetings or work, we are always trying to find more time for ourselves. We want to maintain a healthy diet, but something as simple as eating can become difficult when we’re on the go. A yummy snack that will fulfill your sweet tooth, while still being healthy, is fruit. One of the best fruits to take on the go is an apple. Throw it in your backpack or purse, and pull it out in between classes. If you are someone who is not keen to fruits, try dipping the apple in peanut butter! Another healthy option is to take a bag of veggies. One of College Gloss’s favorites is a bag of carrots. It is especially great for gals on the go because carrots reduce general nervousness. It not only helps you stay healthy, but also calm you during your hectic day. An assortment of nuts are a fantastic snack to put in a baggie and carry with you throughout the day. Almonds are smart to eat before you indulge a meal to make sure you do not binge-eat. And walnuts are healthy because they have omega-3 fatty acids that are good for your heart. Be sure to include pistachios in the bag as a source of potassium. 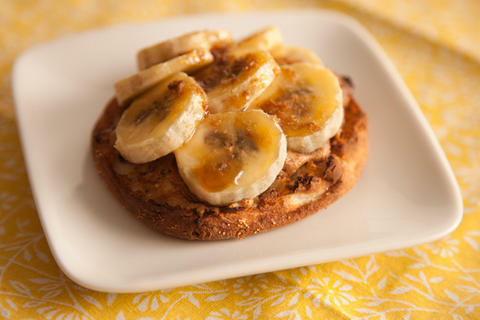 If you find time to spare, try one of the best small, healthy meals around: an English muffin with peanut butter and bananas. It is a good solution if you don’t want a full lunch, but need a little more than a snack. Plus, it is super healthy and will give you a burst of energy! Incorporate these fast, easy snacks into your daily life, and we guarantee you will feel fuller and more energized. Remember, they are not substitutes for meals, and you will still need to eat those, too. Whatever you do, don’t skip breakfast, the most important meal of the day!